Series production, Ultra high-speed performance. Outstanding safety beyond the 300 km/h mark. Enhanced siping in the inner tread area of the ContiSportContact™ Vmax creates a more flexible structure within the profile and helps reduce heat generation. Pronounced cooling grooves also conduct heat away from the profile ribs. What’s more, the extremely tough belt and bandage materials counteract the centrifugal forces generated at high speed. So if you put your foot down all the way, you can be confident that the ContiSportContact™ Vmax will keep you safe right up to 360 km/h. To ensure even greater directional stability, the sidewall construction of the ContiSportContact™ Vmax has been specially adapted to resist the stresses created by extreme centrifugal force. 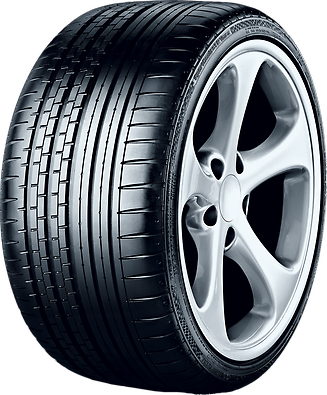 Reinforced bead cores absorb the increased stress more effectively and give the tyre its unique driving performance within the high-speed segment. As you can tell at first glance, the dynamic profile of the ContiSportContact™ Vmax has been specially designed to match the flair of high-performance vehicles. Its most striking features are the circumferential grooves and the transverse grooves in the shoulder area. 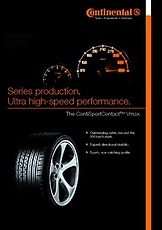 The ContiSportContact™ Vmax – impressive performance, purist design.